As a result, it’s ended up as the lowest grossing of all the DCEU movies, behind even Suicide Squad. It is a bit of a shame, as while it’s a movie with plenty of problems it’s not bad watch. Actually, I better qualify that as the first 30 minutes are pretty rubbish. 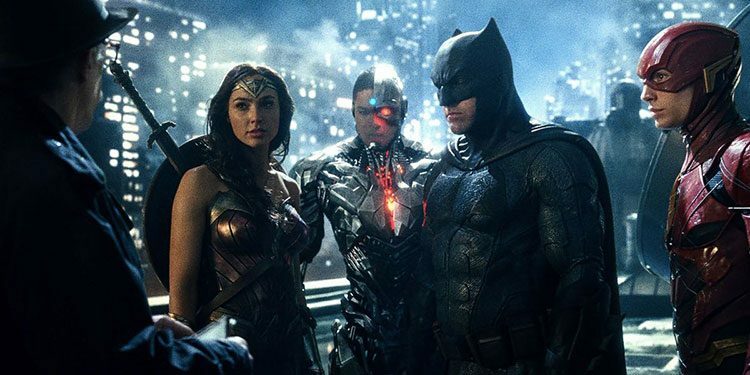 The film tries to grapple with the problem that this is a superhero team where we’ve not properly met the likes of Aquaman (Jason Momoa), Cyborg (Ray Fisher) and The Flash (Ezra Miller) on the big screen before – except for very briefly in Batman vs. Superman. Therefore, it needs to give each of them a proper introduction and let Bruce Wayne (Ben Affleck) put the team together. However, the film is aware that the ‘putting the team together’ parts of movies like this are pretty tedious. The result is a first 30 minutes that’s disjointed, rushed and simultaneously boring, but needs to be done to get to the rest of the film. Things pick up considerably after that, with some good action set-pieces and the characters starting to gel together. It also means that unlike some superhero movies, the villain of the piece doesn’t feel like an afterthought. The main plot revolves around the return of Earth of Steppenwolf, a powerful being who thousands of years ago tried and failed to take over the world, but was thwarted by the likes of the Amazons, the Atlanteans, the Gods and the humans. Now he’s back and wants the mother boxes that are hidden around the world. Together they can unleash an unstoppable power and ensure Steppenwolf will master the earth this time around. Bruce Wayne realises something is going on and so starts putting together his ‘Justice League’, knowing that only those with special powers (and his Batman) have any hope of defeating this evil. They soon realise though that even the Caped Crusader, Wonder Woman, Cyborg, The Flash and Aquaman may not be enough. They need the most powerful of them all – Superman (Henry Cavill) – but he’s dead. Although the whole ‘mother boxes’ thing seems needlessly similar to the ‘Infinity Stones’ that have been woven into Marvel’s movies for the past decades, it’s decent fun. It can’t quite overcome feeling oddly arbitrary and it has one-too-many unintentionally funny moments, but it is enjoyable enough. I also couldn’t help smiling that after Man Of Steel was criticised for levelling half of Metropolis and then ignoring the catastrophic amount of death caused – and as a result Batman vs. Superman went out of its way to point out how no people were around during the most explosive moments – Justice League manages to find an entire abandoned Russian city to blow-up. It is this sort of slightly eye-rolling pandering that means it never becomes the movie it ought to have been. Rather like Avengers: Age Of Ultron, it gets pulled down by too many competing interests and so much concentration on the trying to please everyone that it forgets the movie itself. That doesn’t make it a complete failure, as it does remain enjoyable – but it’s also forgettable. What’s more difficult to forgive is that as with Wonder Woman, some of the special effects are shockingly bad. The digital removal of Henry Cavill’s moustache (which he’d grown for Mission: Impossible – Fallout and couldn’t shave for Justice League reshoots) has been derided by many, but to be honest that’s done well compared to some very dodgy shots that are so bad and cartoon-like they completely throw you out of the film. On the Blu-ray it doesn’t help that it’s not the best transfer, with an often-soft picture, artifacting and occasional, distracting Moiré fringing. The special features, while watchable also feel more promotional than genuinely getting into the meat of the making of the film (although you can understand why Warner Bros. might not want to dwell on that). However, even the boast on the cover that there are ‘Bonus Scenes’ not seen in cinemas, just amounts to a couple of moments surrounding the return of Superman, which hints at how different it might have been (not that the finished return is great, as it feels like they’re artificially trying to make a big deal of it, while really they just want to hurry up and get to the finale). Overall Verdict: A significantly flawed movie that manages to be enjoyable despite its many problems. It’s good enough though that while this could have been the death knell for the somewhat troubled DCEU, it will live to fight another day.